From the country’s famous Friday brunches to buffet breakfasts and evening spreads, diners are often greeted with mountains of food in endless rows of serving dishes. Now a la carte service is replacing that at many outlets that are increasingly conscious of the amount of waste they generate. “Hotels are doing away with the ‘all you can eat’ concept,” said Hilton Abu Dhabi’s Executive Chef Walter Miculan. 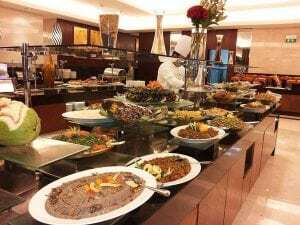 A recent survey of 45 hotels by Masdar Institute scientists Dr Sanaa Priani and Dr Hassan Arafat found that only 53 per cent of Iftar meals actually get eaten, and 46 per cent of lunchtime buffet food during the rest of the year. A fraction of the leftovers are handed to staff or charity and almost all is thrown into bins and sent to landfill, the study found. It has been estimated that about Dh13 billion worth of food is wasted by businesses and consumers. Now businesses responding to the unpalatable trend. Reif Othman, former executive chef at Dubai’s upmarket Zuma restaurant, who now runs the private dining concept The Experience in Dubai’s H Hotel, also senses a trend away from open buffets, and believes the reasons are economical as well as environmental. KPMG’s 2016 UAE Food & Beverage Report shows that 19 per cent of 840 survey respondents said they eat out less now, and 28 per cent are more conscious of what they order. “A la carte is a much more enjoyable experience anyway,” he said. An increasing number of restaurants are moving towards a la carte and set menu options for Iftars and brunches, including Asia de Cuba in Abu Dhabi, Burger & Lobster in Dubai Downtown, Morah in JW Marriot Marquis in Business Bay, and Ramuske at DoubleTree by Hilton in JBR. The Masdar survey found just 12 per cent hotels in the study give leftover food to their staff to eat, but that appears to be changing too. At the three branches of the Lime Tree Café in Dubai, managing partner Corinne Bowker explains that unsold food is shared not only among staff, but with local neighbourhood workers too. “We give to a variety of groups including construction workers and tradesmen,” she said. “We have a policy that no food is thrown, so any leftover bread that day is dried, toasted and made into breadcrumbs. All our packaging is biodegradable, as we consider this to be a major problem too. Not all food can be spared for long without becoming a health risk. James Knight-Pacheco, Vida Downtown Dubai hotel’s executive chef, said his hotel takes the issue of food waste reduction seriously. “We look at using the food after the buffet for staff canteens,” he explains. Emirates Red Crescent runs the Saving Grace driver, collecting unused food from hotels, restaurants and palaces, and distributing them to the less well-off. In addition, at least 30 restaurants in the UAE have signed up to join the government’s new Food Bank, which, when it becomes fully operational, will enable low-income families and labourers to pick up left over food donated by hotels and supermarkets, from designated food banks. “Food waste is one of the most significant drivers of climate change,” said Tatiana Antonelli Abella, founder of the Dubai-based environmental non-profit Goumbook.